Who would decline an invitation to an Easter egg hunt in a home with a moniker like Poppy Cottage? The name alone conjures up all the morning promised. We had been invited last year too but as Screecher Creature No. 4 was a new little Easter bunny himself, at only a couple of weeks old, I think I can be forgiven for choosing the lie on instead. Mister Husband took the other Screecher Creatures but this year I was as geared up for it as the kids were. All week there were talks of treasure maps, shovels, holes and chocolate coins. The spoils of last year’s hunt. The Lady of the House is so good at organising these events she digs holes in her garden and lets the kids loose with the maps and a digging implement. I heard a strong rumour that this year’s hunt activities included homemade piñatas. Of course I couldn’t be outdone and whilst the Screecher Creatures were struggling into their clothes at first light this morning, I crept outside with my own bag of miniature chocolate bunnies, chicks and coins. I dotted them about the garden in little piles of three. It was all over in as many minutes and then it was back inside for a chocolate breakfast. “Can we go?” “Is it time to go yet?” if I heard it once I heard it eleventeen hundred times between 9am and 11am. The high jinks were beginning and 11am couldn’t come quickly enough for me. It finally rolled around and we set off with Easter baskets in hand. Two marquee tents hinted at something more than an Easter morning for the kids and I wasn’t disappointed. There was a veritable feast laid out. Ray had his wood fire burner stoked up and a cooked breakfast was on the menu, complete with gorgeous, sunny, runny free range eggs on white fluffy bread rolls. Tea and steaming hot plunger coffee washed it all down. If I was impressed with this king’s breakfast, I was bowled over with the Easter egg hunt. The kids set off, loot bags at the ready. 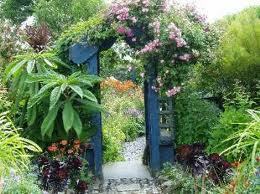 This is a lovely higgedly piggedly garden with lots of gorgeous surprises, twists and turns along the way. The “entrance” to the hunt was a grass lined laneway, and studded in the banks were lollipops! The kids grabbed at them, definite Willa Wonka’s Chocolate Factory excitement going on and just a little ways ahead and off to the left was a fence. A low fence with a huge, huge nest at the other side, as big as a storks nest. It was filled with Kinder eggs and standing guard, or perhaps attempting to hatch them, was a little ceramic duck. This charmed the trousers off me. It was just gorgeous. Further along there was a real life Teddy Bears picnic, little blanket and everything spread out, complete with tea-set and teddy bears. A kitsch cake stand housed some coconut mallows and the tea-pot poured jellies and chocolates. There were a couple of little girls having the time of their lives and I was seriously tempted to grab one of their unattended baskets and fill it for myself. Instead I made do with shoving a few of the gooey treats into my mouth. Onwards. Oh wait, I was supposed to be taking my two and a half year old along with me. Come on, Liam!! The next stop was a couple of washing lines and pegged out to dry were bags of popcorn and other crispy treats. This was fantastic! Across the way I spied a tree adorned with fake (were they, Lucina?) Faberge eggs. I persuaded Liam to head back to the marquee and inspect his loot. But I really wanted a go on the wooden bench swing and a cup of coffee. It wasn’t to be because I spotted another series of gardens and they had very interesting things going on there too. There was a marshmallow garden! Rows of marshmallows harpooned on barbeque sticks and stuck in the ground. A little 70’s television lunchbox gaped open and boxes of mini smarties were there for the taking. Liam had wandered off to inspect the large plastic play house and I left him to it as I sampled and plucked sweets off the ground to my heart’s content. I didn’t care that I was the only adult in there; the others didn’t know what they were missing. A pair of denim clad legs caught my eye. It was as if someone had fallen head first into the hillock and all you could see were legs and shoes sticking up into the air. Ray’s idea of a little garden humour. Another of my favourite displays. I finally got to drink a cup of coffee and thinking things couldn’t get any better for the hordes of excited kids running around the place, Lucina announced it was time for another surprise. She sent the kids into a second marquee and told them to open the large chest and see what they could find. They pulled out two homemade piñatas and these were hung from the trees. It took the kids 10 minutes to destroy all the homemade work and another 5 or so to scrabble about in the grass to collect the spilled treats. Finally, they all sat down to compare and contrast Easter buckets and their contents as Ray served up bubbling pizza from the wood stove oven. What a morning. What a treasure hunt. What a treat! It was definitely a toss-up between who works the hardest; Santa or the Easter bunny. There was no contest really, the Easter bunny in Poppy cottage won hands down. It’s ok though Santa, you’ve got about 8 months to come up with a game plan. But you have your work cut out for you!